The term Shift Work is use to describe an organization practice to make use of the 24 hours of the day by rotating employees. For example, a working day may be divided into three shifts with three employees each covering 8 hours of the day. The main aim of shift work is to increase the productivity of the organization through the effective use of human capital. Historically, shift work started out from the manufacturing industry but is now widely use in other industries like the service industry. For example, a hospital or clinic may require the nurses and doctors to rotate on shift to ensure patients are well taken care of at all times. A restaurant may require their waiters and waitresses to work on shift to ensure the restaurant is always open during peak hours to maximize revenue. Some organizations have more complex shift requirements. They may require their employees to work on weekends or have minimum and maximum hours. An employee may also be entitled to 2 days off per week. The annual holidays of the employees will typically also need to be taken into account. Scheduling employee shifts can be a complex and difficult task. This is especially the case when there are a large number of employees and shift constraints. On top of that, shift work has never been popular and may result in employees morale problems if not handled with care. With the introduction of computer systems, shift managers can now use special software and algorithms to automatically generate shift schedules on weekly or monthly basis. The manager can then review and make adjustments to the schedules before it is published to the employees. 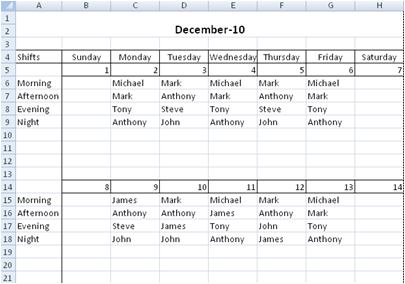 This spreadsheet creates a monthly calendar for assignment of shifts to employees. The shift schedules can be printed easily and the assigned number of monthly shifts and hours of each employee are calculated automatically in a summary worksheet. 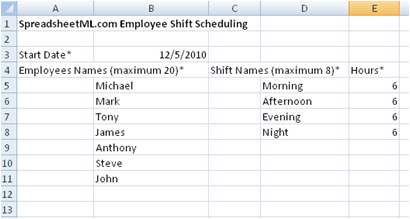 This spreadsheet can be used to assign up to 20 employees to 8 different shifts over a period of one month. The diagram below shows the "Input Parameters" worksheet. The various parameters supported by this worksheet are described below. Start Date* - The Start Date of the shift schedule. A monthly calendar will be generated in the "Shift Assignments" worksheet based on this date. Employees Names - The names of the different employees to be assigned to the shifts. It is recommended to use name initials of up to 9 characters. Shift Names - The names of the shifts that will appear in the "Shift Assignments" worksheet. It is recommended to use shift initials of up to 9 characters. Hours - The number of hours for the specified shift. This will be used in calculating the total number of hours that an employee has worked in a month. This is the worksheet for assigning shifts to the different employees. The monthly calendar and the shift names are automatically generated from the input worksheet. 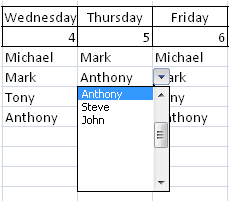 Different employees can be assigned to the shifts through a drop down list in each of the cell in the calendar as shown in the diagram below. 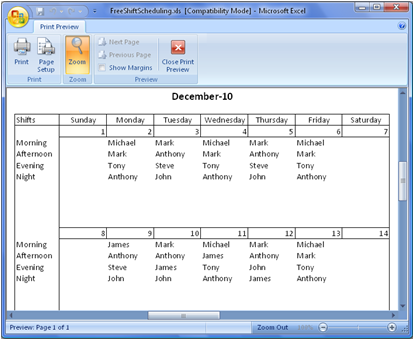 The copy-and-paste function of Excel can also be used to assign the schedules. This worksheet summarizes the shift schedules by calculating the total number of shifts and hours worked by the different employees. All the values are automatically calculated based on the "Shift Assignments" worksheet.